Drop shot rigs – Gary Yamamoto 5″ Yamasenko (Dark Pumpkin with Purple, Black and Emerald) on a Gamakatsu size 1 finesse wide gap hook. 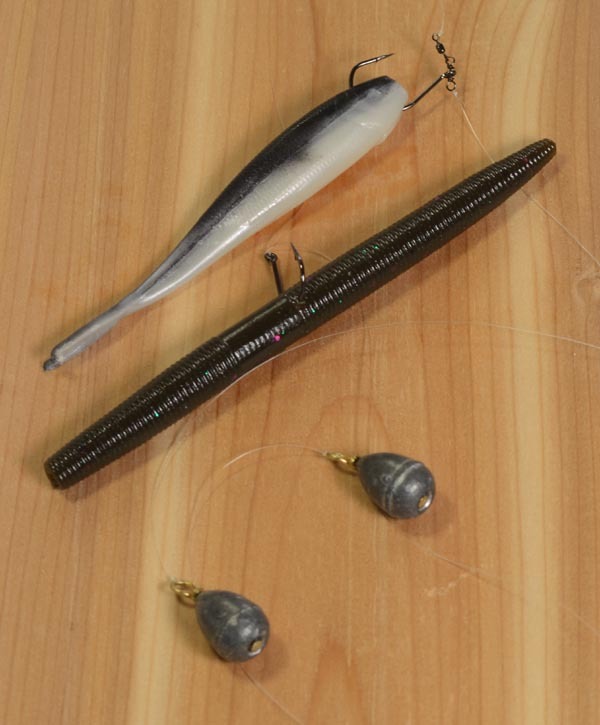 Berkley Gulp 4″ Minnow (Black Shad) on a size 1 Zero Twist (TM) Shot hook from Stringease. I intend on fishing a couple of local one-day bass tournaments this summer and I think a drop shot rig will be a useful addition to my limited bass catching repertoire. There is also a spot (Bass Lake on Manitoulin Island) where I do a lot of perch fishing with the kids that a drop shot rig with live bait will be very useful. It is quite a weedy area so getting the bait up just above the weeds will be helpful (plus I won’t have to clean so many weeds off the kids hooks). Drop shotting is a finesse technique so a good setup is on a lighter, sensitive spinning rod and reel with 6-10 lb test line. Tie on your hook using a Palomar knot leaving a good length of extra line (18-24 inches). If you need a good explanation for this knot (or a huge variety of others) I highly recommend the “What Knot” App from Columbia Sportswear (free for iPhone – What Knot to do in the Great Outdoors). It contains illustrated step by step instructions for a huge variety of knots for fishing, boating and climbing. Size 1 Zero Twist (TM) Shot hook from Stringease Tackle Mfg. Co. Ltd (www.stringease.com) with Berkley Gulp 4″ Minnow (Black Shad). An appropriate sinker is then attached to the tail line. Distance from hook to weight of about 18 inches is a good start but can be varied depending on a number of factors, for example, if you are trying to stay just above the weeds. Good electronics can now distinguish the weed tops from the hard bottom and can be a useful guide here. Where regulations allow, two hooks can be used on the line spaced out at varying distances (in Ontario (2014) a line may not have more than four hooks). 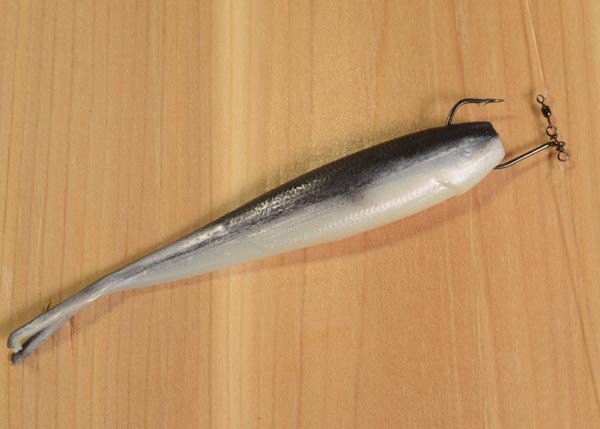 Possible baits include, live bait, wacky worms, various soft plastics, flies (a muddler minnow would be good choice). Cast to target and let sink while keeping enough slack out of the line to feel a strike. Let sink to the bottom. Still fish or slightly jiggle the bait without lifting the weight off the bottom. Maintain a taught line to feel any strike. The drop shot rig is good for depths of 5 ft or deeper with more weight needed the deeper you go. For shallow water fishing (3-5 ft) its likely better to fish the type of plastics shown in the figures without a weight. Drop Shot, Largemouth Bass, Perch, Smallmouth Bass.